In the past month, two ideas which I strongly support have suddenly become accepted by significant sections of the general public. The first of these is that overseas aid is in the national interest of rich donor countries. No one who has seen the huge numbers of refugees crossing into Europe now doubts the value of properly funding a refugee response. Europe's failure to properly care for refugees in the Syrian region means that they will be forced to accept over one million refugees into their care and education systems. At twenty five times the cost of looking after them properly in the region. Saving a few million Euros in aid to Syria is leading to a 10 billion Euro bill for caring for refugees in Europe. We have turned a regional crisis into a huge domestic challenge which threatens the careers of the European political classes. The second idea is that caring for refugees includes providing education for their children. One of the key drivers for the current movement towards Europe is the lack of schooling for refugee children whose parents are not prepared to accept that their children will grow up illiterate with no prospects. Education is a huge priority for refugees. The lack of a school place will drive a family to cross continents and take enormous risks in order to provide a future for their children. Now we need a sea change in the way that we respond to humanitarian emergencies. Particularly those which become entrenched in cyclical conflict that turns into chronic crises, away from the cameras but no less catastrophic for those affected. The change we must argue for is the deconstruction of our bi-model and simplistic approach to overseas aid separates out our aid budgets into two distinct modes of operation. Humanitarian aid is our stock response to conflict disasters and consists mostly of food, water and shelter. Education comes a long way down the humanitarian priority list when scarce humanitarian funds are parcelled out. Less than 2% of aid to conflict emergencies goes on education, even though children commonly make up over 50% of populations affected. 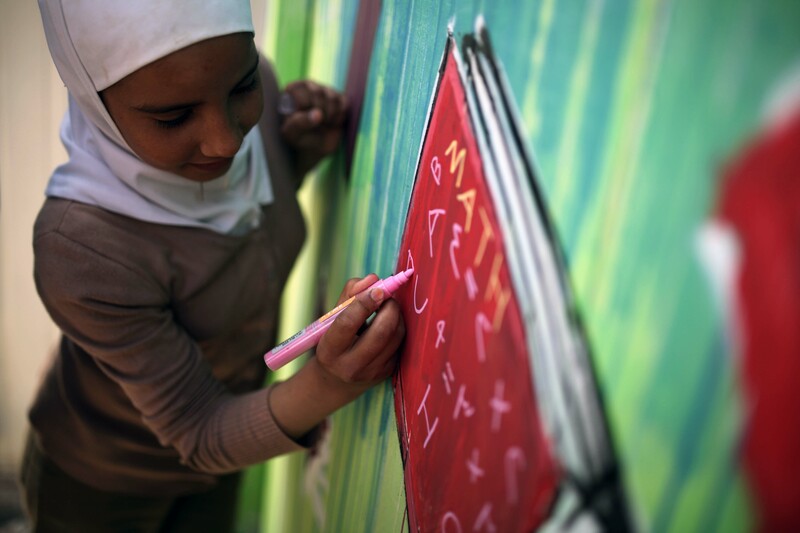 With the result that less than one third of Syrian refugee children have a place in a school. The other type of aid -- development aid -- is much more aware of the need to fund education. 8% of development aid goes on schools, colleges, teacher training and vocational courses. It's a big success story of the development goals. The problem is that development aid is predicated on a stable environment where a government and the private sector can use aid money to build sustainable systems and communities. Development donors rarely consider a war zone a good bet. They also shy away from refugee camps, displacement sites and chronically insecure areas. In this context the idea of a global humanitarian platform to fund education in emergencies is a good one. A fund which is devoted solely to the education of those children who are not in a context which would attract development funds would ensure that money flows to meet the needs of 28 million conflict affected children who are not currently engaged in any kind of education process. The fund would be very clear about its goals and the measures of success. And those who run the fund would not have to compete with the food and water people for an appropriate share of humanitarian appeal funds. It's a mystery to me why this fund has not come about before now. The need for it has been apparent for several years. If not decades. At a certain point we might wonder whether, as a sector, we lack imagination. It is certainly true that even good ideas take a while to catch on. The clear lessons of the Syrian conflict perhaps provide the impetus we need to declare once and for all that the time for this idea has finally arrived. How can we build on this potential? Firstly we have to gather our resources to put the arguments forward at any opportunity. Thanks to the World Humanitarian Summit we have a great opportunity given to us in eight months time. In the run up to the Summit national donors need to be left in no doubt that a global fund for education is a clear route to solving one of the most intractable challenges of leaving no one behind. Before the end of 2015, we must see this new platform launched. The UN humanitarian system will need to also shift from an interested onlooker to a champion of this approach. And NGOs themselves should engage energetically with the work of designing a fund convincing enough to come out of the Istanbul summit with a life of its own. To an 8-year-old child, a refugee camp without a school is like a prison cell without a window. War Child UK has launched the HELP campaign to build commitment to investing in education for children in conflict areas. We know that a lack of education forces refugee families to take enormous risks to get their children into school. A humanitarian fund for education is a lifesaving idea whose time has come. Rob Williams is Chief Executive of War Child, the UK charity dedicated to supporting children affecting by conflict. The bulk of his career has been in relief and development work including work in Cambodia, Burundi and conflict zones in Africa and Asia. As Concern's Operations Director in New York from 1999-2002 he was responsible for child survival programmes in several countries, achieving large reductions in maternal and infant mortality in poor urban and rural communities. In the UK he has been, at various times, Deputy Children's Commissioner for England, Chief Executive of Bliss - the premature baby charity, and Chief Executive of the Fatherhood Institute.